Robert Bays concentrates his practice in civil trial litigation and commercial work. His trial work and general commercial practice in both Ohio and West Virginia has included an array of different experiences from commercial litigation, personal injury litigation, construction litigation, products liability, legal and medical malpractice, employment issues, partnership litigation, estate and trust litigation and oil and gas litigation. 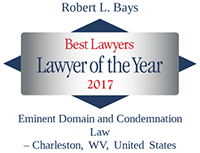 Robert has appeared for the owners of business properties in eminent domain litigation and for clients in business disputes, significant personal injury or death claims.